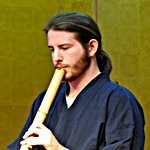 ESS Shakuhachi Forum :: Kari! even more kari! Posted: 2015-09-06, 16:52 Post subject: Kari! even more kari! As you can suppose from the title, I have a problem with kari notes. It looks like almost all my kari notes are under-kari-ed (sorry...). I slightly pull the flute down to reach correct kari - and lose the sound. I found one tip from Kaoru Kakizakai sensei - to pull the flute not straight down but to diagonal, trying it. Are there any more ways to achieve kari? I move the flute here and there and get lost. Please help. Posted: 2015-09-07, 13:47 Post subject: Kari! even more kari! For me, rather than thinking about physically moving the flute, I move my chin. I keep the flute fixed under my bottom lip, and drop my chin into my chest for meri notes, for kari notes I lift my chin up and "push" it forwards. I think by physically moving the flute itself you may find you lose contact with the utaguchi which may explain the sound dropping out? Posted: 2015-09-07, 23:42 Post subject: Kari! even more kari! It looks like I formulated incorrectly. I move the flute down just by moving my chin up - and lose the sound. Posted: 2015-09-08, 17:30 Post subject: Kari! even more kari! Have you tried practicing while looking in the mirror? It's important to aim for the same spot on the utaguchi even though the flute has moved/is moving. Maybe try playing a long tone and moving the flute in different directions, while maintaining constant sound? All that being said, it's not easy, and it's even harder to explain online! Posted: 2015-09-08, 21:43 Post subject: Kari! even more kari! Jam, mirror no, but all this moving here and there - yes. OK, let's hope that following Kaoru Kakizakai sensei advice will work finally. Posted: 2015-09-10, 13:42 Post subject: Kari! even more kari! im not an expert myself in this, but i remember in a lesson with riley lee, he showed me how to raise the pitch of the note without moving the chin at all. Turns out by tightening ur lips and moving them a bit further away, u can actually raise it almost a semitone without moving your head, at least half a semitone, so that combined with the upper chin movement will fix things up. Posted: 2015-09-10, 21:34 Post subject: Kari! even more kari! meoweth, thank you! I'll try. Posted: 2015-12-10, 13:47 Post subject: Kari! even more kari! Most new players has a tendency to play the note pitch low. Getting your pitch back to a correct kari pitch requires not only getting your head up but also a good embouchure. If you have something to reference your pitch to that can help. Either a recording on someone playing correct pitch or a pitch meter. I normally recommend to new players spending a little time playing to a meter and watching, becoming aware of their pitch and when its right. The meter should be a temporary thing to help you learn to accurately hear your pitch. Best wishes and good luck! Posted: 2015-12-10, 21:45 Post subject: Kari! even more kari! I've never used pitch meter. Just downloaded one, it turned to be with european notes pictues, I don't know them )) Will look for Japanese! Posted: 2015-12-10, 22:15 Post subject: Kari! even more kari! Typically it should be set for 440. Them just try and make a D when playing Row. Posted: 2015-12-13, 13:49 Post subject: Kari! even more kari! Galina, when you move your chin up do you change the direction of your breath? So imagine yourself moving chin up without moving the breath direction and you will blow over the utaguchi instead of hitting the right place. So when you move your chin up, make sure you direct your breath more downward accordingly. Posted: Today at 05:59 Post subject: Kari! even more kari!